1914, the year of Skryabin’s Prometheus and Ravel’s Daphnis in London, was also the year Gustav Holst began work on his suite for large orchestra, The Planets. According to Raymond Head, the year Holst began looking at astrology “fairly closely,” the theosophist Alan Leo published The Art of Synthesis (1912), an innovative astrological book, which also includes an “Astro-Theosophical Glossary.” 1 Head believes that it is this book that inspired the composition of The Planets. 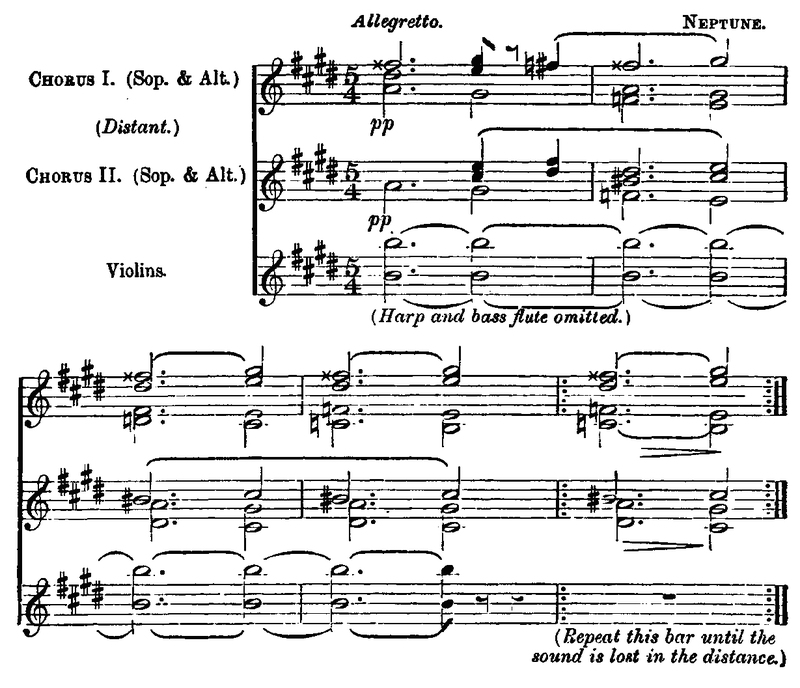 The Planets includes wordless chorus in the final movement “Neptune, The Mystic.” Holst’s approach to such a chorus is new, for “Neptune” is the first strictly orchestral work that uses a “hidden” chorus. Hidden offstage chorus has been central to the idea of dramatic vocalization since its early appearance in Weber’s Der Freischütz onward, yet this was the first time the technique was applied to a symphonic and specifically non-dramatic context, not a ballet, nor opera. When the chorus enters at the end of this final movement, the voices double instruments for quite some time. As the instruments slowly fade away the voices move into the foreground. Finally, they are left alone, a cappella, fading away into the distance. The following year, 1921, Vaughan Williams composed a similar ending to his Pastoral Symphony. 1 Raymond Head, “Holst—Astrology and Modernism in ‘The Planets,’” Tempo 187 (1993): 18. 3 Imogen Holst, introduction to The Planets, op. 32, by Gustav Holst, in Collected Facsimile Edition of Manuscripts of the Published Works, vol. 3 (London: Faber Music, 1979), 9. 4 Richard Greene, Holst: The Planets (Cambridge and New York: Cambridge University Press, 1995), 28–29. 6 Coates conducted the premiere of Delius’s The Song of the High Hills on 26 February 1920. 7 Edwin Evans, “Modern British Composers VI.—Gustav Holst (Concluded),” Musical Times 60 (1919): 659. 8 Gustav Holst, The Planets. (New York: Dover, 2000), 162. 9 Sir Adrian Boult, “Interpreting ‘The Planets,’” Musical Times 111 (1970): 263. 10 Imogen Holst, introduction to The Planets, op. 32, 13. 11 Sir Adrian Boult, “Interpreting ‘The Planets,’” 263. 12 Imogen Holst, introduction to The Planets, op. 32, 13. 13 Ernest Newman, The Sunday Times (21 November 1920); quoted in Greene, Holst: The Planets, 33. 14 Alfred Kalisch, “London Concerts,” Musical Times 61 (1920): 821. 15 Quoted in Richard Greene, Holst: The Planets, 36. 17 Ralph Vaughan Williams, “Gustav Holst,” Music & Letters 1 (1920): 190.